Ryan Gauld scored as an experienced Hibs Development Squad recorded their seventh consecutive win in the SPFL Reserve League with a 5-0 victory over Ross County at the Oriam on Monday afternoon. Marvin Bartley, new signing Jonathan Spector and 44-year-old goalkeeping coach Alan Combe all played a part in the match, which saw Gauld in action for the first time since suffering a hamstring injury in a Ladbrokes Premiership defeat at Celtic in early February. 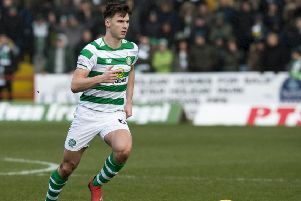 Gauld played around an hour of the second-string clash, netting the third goal as Grant Murray’s side took top spot in the Reserve League table. County had two good chances to take the lead in the opening 20 minutes. With just seven minutes on the clock, Hibs goalkeeper Patrick Martin brought down visiting forward James Wallace in the box, but Mark Gallagher sent his effort from 12 yards wide of the goal. Ten minutes later, a misplaced pass from Innes Murray gave Joel MacBeath a sight of goal, but Spector cleared off the line with Martin beaten. Lewis Allan broke the deadlock on 22 minutes, converting Callum Donaldson’s cross from around ten yards. 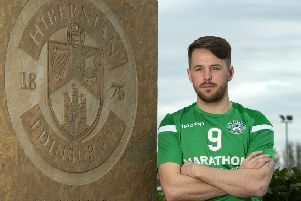 Murray had the ball in the back of the net two minutes later from Gauld’s cross, only to see it ruled out for offside, but Ryan Shanley doubled Hibs’ advantage on 28 minutes. Fraser Murray beat several County players before playing in Shanley on the edge of the box and the young forward had time to place his shot beyond ‘keeper Tommy Dixon-Hodge. Gauld made it three on the half-hour mark, receiving the ball from Ben Stirling before sending an effort high into the net. Combe, listed as a trialist, replaced Martin at the half-time interval as Hibs sought to build on their lead. Gauld made way for Josh Campbell on 60 minutes, with Jamie Gullan and Kevin Waugh coming on for Shanley and Spector on 67 minutes. Gullan, currently on a development loan at Raith Rovers, had a hand in the fourth goal for Hibs, crossing for Innes Murray to steer the ball home on 85 minutes. And Murray grabbed his second and Hibs’ fifth three minutes later, sending a fierce first-time effort past Dixon-Hodge from Allan’s lay-off. The victory puts Hibs top of the table, leapfrogging Celtic and Rangers who have games in hand. The Easter Road side travel to the Hummel Training Centre next Monday to take on Rangers reserves. Their penultimate match is a home game against Dundee United on April 15, before a trip to Fife to face Dunfermline at Kelty Hearts’ New Central Park home on the final day of the campaign. Hibs: Martin (Combe 46), Stirling, Sadiki, Spector (Waugh 67), Donaldson; Bartley, I Murray, Gauld (Campbell 60), F Murray; Allan, Shanley (Gullan 67). Subs not used: Paton, Block.